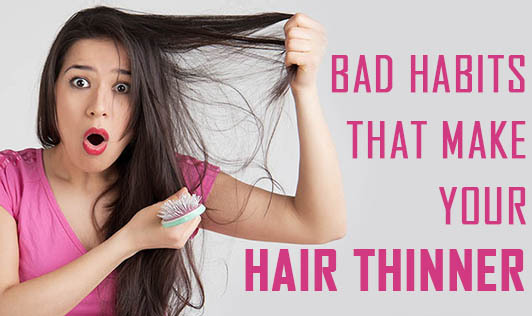 Bad habits that make your hair thinner! From styling products to flattening irons, they're all quite bad for your hair. It's definitely fun to try new hairstyles and colours for your locks, but using too much of heat and chemicals can damage your hair undyingly. • Using hot styling tools: The scorching temperature of your styling tools damage the proteins that make up your hair and its protective cuticle. "Once the cuticle is damaged, the moisture balance is disrupted and your hair is more prone to breakage, "says Dr. Bauman. • Steamy showers: Hot water dehydrates your hair, making them brittle and dry. The heat washes away your hair's protective oils and the scalps pores do too much to keep up with oil production which can damage the root leading to additional shedding. • Crash dieting: Not eating a well balanced diet and starving can also cause thinning of hair and hair loss. • Harming wet hair: When the hair is wet, the protective cuticle is slightly raised. So, brushing and combing your locks when wet, followed with aggressive towel drying can ruin your locks. • Tight hairstyles: A tight ponytail or braid is a quick and easy way to set your hair, but tight hairstyles can put excessive tension on the hair follicles, damaging and creating scars that destroy them permanently. This can lead to "Traction alopecia", a condition that permanently weakens the follicles making it impossible for hair to grow back. • Long lasting styling products: These styling products are usually high in alcohol which makes the hair dry and brittle. Once your brush your hair, that residue causes the hair to break. • Oral birth control pills: A wrong birth control pill can weaken your hair. Pills that contain androgens can cause hair loss for someone who is androgen sensitive. • Itchy scalp: Scratching your head may result in hair loss. • Too much sun exposure: Prolonged UV exposure causes the layers of the cuticle to weaken and break. • Not washing your hair frequently: It's important to keep your scalp clean. A build-up of product or excessive dandruff on the scalp can clog hair follicles, making it difficult for hair to grow. • Medications: Certain medications or hormones can cause hair loss as they interfere with the normal cycle of hair growth.